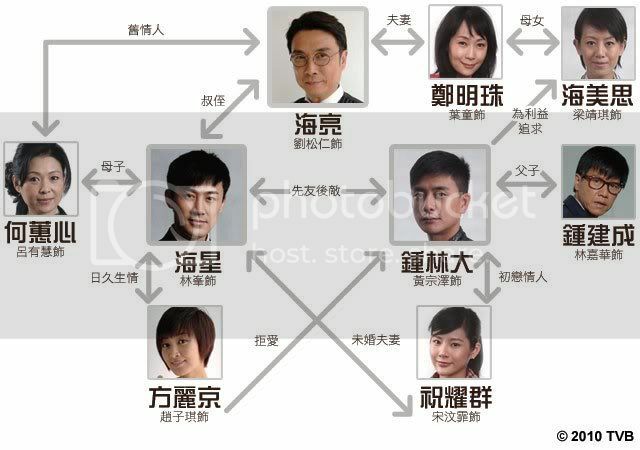 might watch this for raymond and the fact that i miss the old days tvb's chaebol family story eg. golden faith, threshold of an era. I wanna get the HK feeling back too...too much korean drama lately. This look promising since the older cast(well known ones) are all great...I have no idea who the girls are, its been 6 months already and I'm still not all that cool with the new people cute faces and lack of acting skills. Im already 3 episodes in, the story line is kinda boring right now. I feel the actress that plays Raymond's fiance and bosco's ex kinda dull. Her emotion she tries to display always comes off fake to me. Hahaha... I have to admit that I'm watching this because of Raymond and Bosco and maybe even Damian. When I saw the poster, it reminded me of The Drive of Live. I really liked that series. I agree with xstarBURST, that girl who plays Raymond's fiance is kinda dull and woody(?). Whenever Damien is in a series, it's most likely a grand production lol. It's a TVB and Shanghai production so there's going to be dubbing, which really annoys the heck out of me. We'll see when I actually get time to watch this series. I think the dubbing is actually ok. The only person where you can really see/hear it's dubbed is Raymond's secretary. Ooh, Raymond and Bosco. But I don't like Toby though. Something about her bothers me. does anyone know that "Angel" song that seems to be popular with the cast in the series. Im interested to hear the whole song. I searched and couldn't find any information so i have a feeling it's not a legit song. ^ Yeah, I was trying to look for it too! & This drama is so good right now. <3 Damien is such a good actor, I loved him in Catch Me Now. ^ It's called "I hear angels"
I've been looking for it for about 3 days now with no luck. People on a Hong Kong forum said that it is possible that TVB made this soley for this drama and it will not be available anywhere until the soundtrack goes onto the HK market. I love this drama. It's very very good. Very captivating and well written. Shows betrayal within business and love. I despise Korean dramas and Japanese dramas because of this sole reason. Bad acting, bad plot, no thought from within. Bad songs as well. Hong Kong dramas are by far the best I've ever seen. Especially those by TVB. ATV's best drama I've seen is "A million lights" I believe. .... Is this show good? There are lots of new actors/actresses in it! Trust me, the first episode is not really good honestly. But the rest of the series is so suspenseful. I stayed up all night to watch it all over once again!!!!!! It's really good, not dull at all. There's betrayal, truth and tragedy between business, lovers and friends. Unlike a lot of dramas out there. It's quite good so far Very intriguing. Very well thought out plot. The new actors/actresses aren't bad. They're watchable. Do not read wiki then -.-" yeah! raymond's song rocks!!!! !~ :3 im waiting for more stuff within the business. I'm curious to know more about the past. EPISODE NINE BROADCASTED A FEW HOURS AGO CLICK HERE FOR IT! Yes, I think tvb made the song "I Hear Angels" for this series. I think they've done it before, though. Tvb released an album before with all these subthemes. gosh... can't believe it took over 2 weeks to get to the meat of this series... it was so boring at the beginning. It's a bit more interesting now that Bosco's shaking things up. the thing that annoys me most though is the lack of energy. I mean, Wing Hoi is suppose to be this huge multi-national company, but it always looks so quiet and dead compared to say...Off Pedder (畢打自己人). I mean yes, Damien's office and house are huge, but they looks so empty and impersonal. I also don't like the lighting in this series; it's always so dim.